Today was a big day for Mr. Finnegan Nack. He got his first real bicycle! John and I had been talking recently about getting him one, and when we went to the bike shop today to find a replacement for John's stolen bike, Finny instantly bee-lined for the kids' bikes. As soon as he laid eyes on "his" bike (and he referred to it as such), he got on, started to ride, and would not get off. 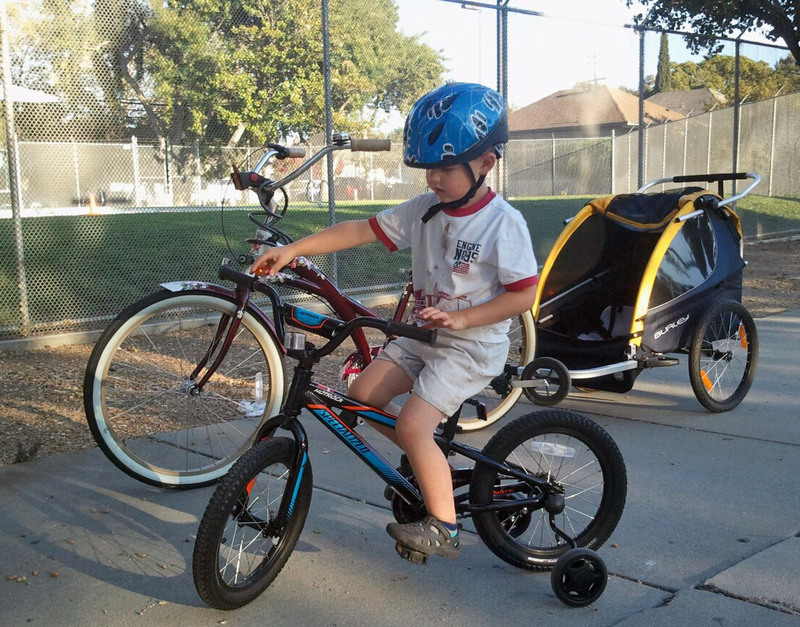 Now, mind you, this is the same kid we've had to cajole into riding his pushbike, and who only last week rode his Big Wheel all the way to the park up the street. So when he continued to endlessly ride the little bike around the store, and asked if we could get it, how could we say no? He LOVES the bike. 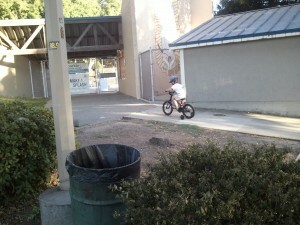 He proceeded to ride his bike all the way home from the bike shop (just under a mile! ), take a quick break for lunch, then hop back on and ride it all around the neighborhood, ride it around and around at Hummingbird Park, which has a circular sidewalk "racetrack," ride it home, take another quick break for dinner, then ride it up the street to "train track park," ride it around and around at the park, then ride it all the way home! I think he's feeling like such a big boy to have his own vehicle to ride. He can snap his helmet straps himself, and he's essentially mastered the coaster brakes already! He loves the little orange plastic bike bell we got him - he rings it all the time while he's riding. John notes that he also loves braking hard and leaving little skidmarks on the sidewalk (true!). He's even taken a couple spills and he just dusts himself off and gets back on, which is great (and very unlike Finny!). I have never really seen him this excited about anything physical - so we are thrilled to see family bike rides in the near future (probably with Henry in the bike trailer, which he really enjoys - he wants me to ring my bike bell constantly, and I hear him laughing his head off back there).